HOWIE GARBER is a professional fine arts and nature photographer. He has lived in Salt Lake City since 1972. Howie’s interest in photography started in 1969 when he took a “History of Photography” class while at the University of Rochester. He remained an amateur for many years. At age 39, he traveled to Nepal, his first trip outside North America, and shot 40 rolls of film while trekking for a month. This convinced him to spend more time with his cameras. While traveling in South America during 1990, his wanderlust was rewarded with an incredible stroke of luck. On his birthday, he was picked up while hitch-hiking by a Brazilian biologist who was doing jaguar research. Experiencing the wonder of observing wildlife in natural habitats was an incentive to improve his photography skills and start a second profession. Since then he has traveled and photographed on 7 continents including China, Bhutan, Patagonia, Peru, Antarctica, Brazil, Kenya, England, Alaska, Australia and Switzerland. He often returns to the same locations. Howie’s images have been widely published as book and magazine covers; and in calendars, and greeting cards. Some of his clients have included Newsweek, National Geographic, Patagonia, Anheuser Busch, the Sierra Club, National Audubon Society, Greenpeace, and ColdWater Creek. In 1997, he received a prestigious award from the British Broadcasting Corporation. Howie won the Wild Places (Landscape) category of the BBC Wildlife Photographer of the Year contest. That same year, his photo of two mountain goats won the Endangered Places photo contest sponsored by Outdoor Photographer Magazine, Mamiya and Lowepro. During the summer of 2000, his work was featured in Nikon World. His work has been exhibited at the Smithsonian Museum and the Museum of Natural History in London. In 2004, his image of a caiman won the Animals in their Environment Category of the BBC contest. Since 1983, Garber has worked as an Emergency Physician at small and large hospitals all over Western U.S. and Alaska. He finds that there are many similarities in his two professions. Every day as an outdoor photographer is different and often full of surprises. Success depends on multiple factors-weather, planning, animal behavior and luck. "In the hospital and in the field, you must accept that many factors are out of your control." 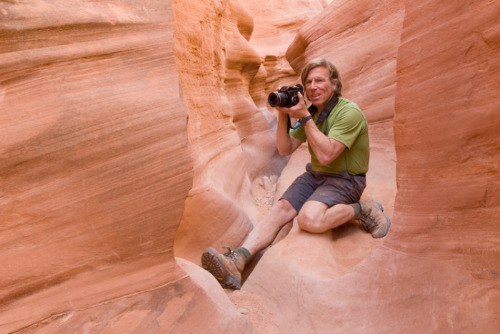 In the same way that providing good health care is a team approach, his success as a photographer has likewise been dependent on wildlife biologists, gifted athletes, pilots, and river guides who have contributed to his success. "One of the challenges that remains is how to use photography as a tool for conservation. Artistically capturing pure beauty seems hedonistic and socially irresponsible at times. It is important to document what we are trying to save as well as what we are destroying at a fast pace." Recently Howie has worked with Utah Physicians for a Healthy Environment(UPHE.ORG) to improve Salt Lake City’s air quality. He has given numerous slide shows on his travels to the public as well as political leaders. He enjoys teaching photography and is available for slide shows, workshops, and one on one instruction. Howie has given up his medium format and panoramic film cameras. He now shoots with digital Nikon and Olympus. In his Fine Arts images, he tries to exhibit photos that transport you to another place.